Despite the ongoing physical development in brickfields little India, there is no effort to address the cries and uncertain future of petty traders’ loss of business in the current temporary locations. Yet the authorities are more concerned and continue to spent money on the beautification and installing artifacts. The neglected petty traders and hawkers complains are not falling in the minister’s or deputy minister’s hears. There was no in-depth study, expert opinions and no real effort to make petty traders survive in the new location. They face an uncertain future with no customers coming due the poor infrastructure like parking, traffic congestion and confusing traffic flows and DBKL has no clue to solve the problem. DBKL must have the political will and expert advice to build a proper food court with sufficient parking, drainage, garbage clearing capacity to appease the affected petty traders and hawkers. DBKL has formed a task force to look into the contentious issues raised. The task force do not have urban development experts and planners to assess the physical and human characteristics needed to make little India successful. Minister for Wilayah Persekutuan and Urban Wellbeing Datuk Raja Nong Chik Raja Zainal is confident that all will fall in place once the project is completed. The whole project missed the “people first and performance now” slogan of Prime Minister. There are many unresolved issues with no consensus yet. There was no blue print and open consensus building discussion at the inception of little India. It looks like this development is done to provide contracts for government cronies and not to help and develop brickfields into successful little India. It shows the inability of government agencies like DBKL to really understand the problem and come out with successful and profitable development. What is the objective of the brickfields little India development? Is it to genuinely help the affected traders or just to show case the government effort to buy Indian community votes. In the process of building little India there seem to be more unhappy parties than beneficiary ones. DBKL time and again overlooks the need to provide parking facilities in township development projects. With the years of town planning and management experience, DBKL should not be undergoing this kind flip flops and messy negotiation processes. DBKL being the largest city council in the country should provide exemplary roles lessons and roles for other councils to emulate. Was Masjid India little India? Any person with an ounce of knowledge about Kuala Lumpur knows that for as long as people have lived and worked in the Masjid India area, it has been the heartbeat of locals and outsiders refer to as Little India. To be sure, there are other parts of the city that have, and continue to have a distinct Indian flavour and historical influence. There is the Sentul area or the predominantly Indian part of Brickfields, to note just a couple of prominent examples. Whilst there is – and always has been – only one Little India in the city, that is the Masjid India, it seems certain elements within the government are in the process of orchestrating another slight of reality and to rewrite history. Perhaps this may not be of the same magnitude of erasing the references to Yap Ah Loy in our children’s history books as the founder of Kuala Lumpur, but it sure would rank right up there among the more graphic examples of just how such campaigns to rewrite history continue to work right here in our own back yards. In a reply to my supplementary question in dewan Negara on 19th july 2010, the minister for Wilayah Persekutuan and township (Perbandaran) Senator Datuk Raja Nong Chik bin Raja Zainal Abidin replied that as far as he knows Masjid India was never referred to as Little India. The area was referred as Masjid India because the mosque there was managed by Indian Muslims but the traders in that area were from various races mainly Malay traders and a few small Chinese businesses. Therefore Masjid India and its surrounding were never known as little India. Well Mr Minister for your information, Malaysian tourism board and all tour operators have all along highlighted and promoted Masjid India as little India all over the world. Little India located in Masjid India is one the many tourism spot in kuala Lumpur city tour all these while. The other tourist attraction in Kuala Lumpur are Chinatown, Central Market, local bazaars and the many luxurious shopping malls. In these website guess what is available in Masjid India? “Fancy seeing yourself in a lovely Indian saree? Then come by Little India located along Jalan Masjid India. Little India is exciting and vibrant and the place is absolutely alive with colours! Visitors to the place will feel as if they are in a bazaar. The streets are lined with an array of goods that will capture any shopper’s eye – from colourful sarees to jewellery, food to fabrics. Here you can also sample a variety of Indian cuisine, from fresh milk to Indian breads to snacks. The food and the culture are something any tourist should experience. It is a whole new world.” The address of this place is also clearly spelled out that little India located along Jalan Masjid India, 50100 Kuala Lumpur. Where are Malay and Chinese traders mentioned? They were spartanly present but Jalan Masjid India was predominantly Indian. Even in google.com, little India is all about Masjid india. You take any website on tourism Malaysia, little India is all about Masjid India. That being the case, how is that the minister for federal territory is ignorant about Masjid India being little India? 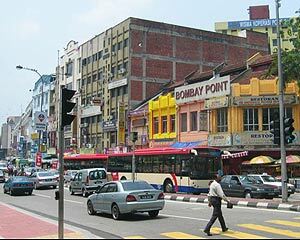 So it appears that some concerted efforts are well underway to now prop up Brickfields – and of course, the government surely only means just the short strip of Indian shops in Brickfields as the “real” Little India, in contrast to the Masjid India area. Now, do you suppose this is simply due to the apparent claim made by Dato’ Raja Nong Chik above? You don’t suppose it has especially to do with the fact that Masjid India, which of course has been for decades now subjected to a systematic strategy of watering down of the Indian presence, is perhaps one of the historically most distinct and centrally located Indian presence in central Kuala Lumpur? You don’t suppose this has anything to do with the fact that despite the watering down of Indian presence in Masjid India, this distinctly and historically India-flavoured enclave is perhaps one of the most valuable plots of land in the city? Surely it must raise a few concerns in some quarters that continuing to have a prominent (by size, flavour, and name) Little India in the very heart of the city – seems contrary to the designs for the “new” image of Kuala Lumpur that they might like to impose. In the process – and no disrespect to the people of Brickfields – to conveniently and officially displace Little India to a less central, less prominent, smaller, and more confined neighbourhood seems like a necessary part of this agenda. Now, I would be the first to admit that change is an inevitable part of any community or neighbourhood. As with most parts of the Kuala Lumpur, Little India – otherwise known as Masjid India – has undergone changes. But this preoccupation with wanting to have Masjid India disassociated from also being known as Little India strikes me as going deeper than what the good Dato’ said above seems to imply. So whilst the MIC take their PM-endorsed latest dog-and-pony show known as the ‘1Malaysia People-Friendly Programme’ on the road to woo voters back to the MIC, the government seems simultaneously bent on a not so people-friendly programme of rewriting historical facts. What a slight of the political hand indeed. Quite typical, isn’t it? I for one am inclined to think there is more to come about this matter. And let’s just say, for now, there is something real fishy in this spicy episode about Little India.